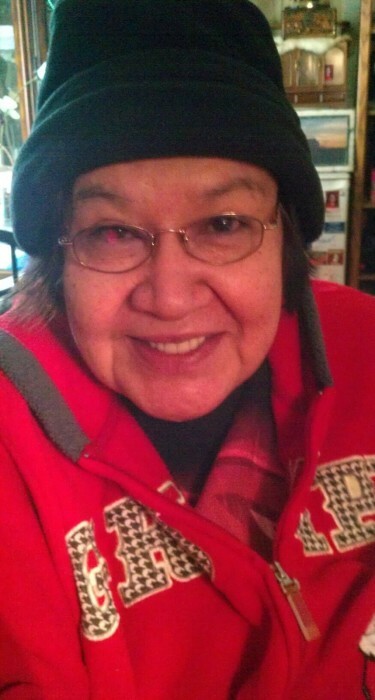 Geraldine Yvonne (Clark) Hart, age 68, “Bimwewecamig ikwe” which means “Thunder in the distance woman” of the Martin Clan and Bemidji, Minnesota began her journey to the spirit world on Monday, March 25, 2019 from her home, surrounded by her family. She was the daughter of William and Frieda (Hart) Clark and was born in Red Lake, MN on December 3, 1950. Family that welcomes Geraldine to the spirit world are her parents; William and Frieda, siblings; Rosella Hart, Edna Kingbird, Melvin Smith, Vernon Clark, Larry Smith, Francis Clark, Oliver Clark and Donna Clark, nephew; William Clark, Jr. and many other relatives. Those she leaves behind are her daughters; Verleen (John Belmont) Smith of Cass Lake, Chantelle (Jonathan Griffith) Frazer of Bemidji and Billie (Steve Wosmek) Carter of Shevlin, special friend; Robert “Sonny” Huntsman, brothers; David (Teana) Clark, Morris Clark and William Clark, Sr., grandchildren; Justin (Amanda), Cheyenne (Matthew Sr.), Keanu, Cherokee, ToniSue, Brittany, Satish, Atreju, great grandchildren; Riley, Matthew Jr., Calliope, Dirk, Kash, Keanu Jr. and William, many nieces, nephews and more family members. An overnight wake for Geraldine will begin at 2:00 p.m., Thursday, March 28th and continue until her traditional service at 10:00 a.m., Friday, March 29th all to be held at the Redby Community Center in Redby, MN. Margaret Porter will be her Spiritual Advisor. Pallbearers for Geraldine will be Satish Pant, Cherokee Graves, Kenny Cloud, Jr., Jonathan Griffith, Jude Chastek and Tyrone Thunder. Her honorary pallbearers are Ellen Adams, Sharon Columbus, Donna Kloehn, Aldene Morrison, Kathy “Chatty” Boswell and Robert “Sonny” Huntsman. Interment will be in St. Mary’s Catholic Cemetery at Red Lake, MN immediately following her Friday service.